10,000s of visitors expected in Hevron on Shabbat of weekly reading of Torah portion of Abraham's purchase of Cave of the Patriarchs. 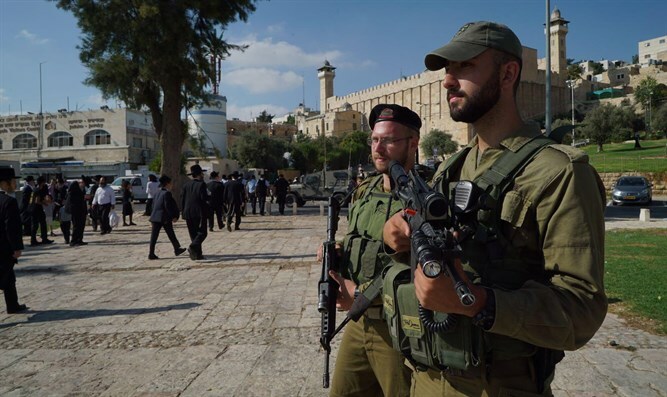 The Israeli police, the security forces and the Border Police have completed preparations for Shabbat "Chayei Sarah", which will take place this weekend with the participation of tens of thousands of visitors in Hevron. The weekly Torah portion 'Chayei Sarah,' which will be read in synagogues around the world this week, recounts the story of how the Patriarch Abraham purchased the Cave of the Patriarchs in Hevron to serve as a resting place for his wife, Sarah. Thousands of visitors are expected to arrive in Hevron and nearby Kiryat Arba on Friday. Police and security forces have increased their presence and have made arrangements to provide security and ensure the flow of traffic despite the huge crowds. Drivers are required to obey police instructions. No parking is allowed in areas that block traffic. In any exceptional event, the public is instructed to contact the police department or the police stationed on the ground. The police recommend that visitors arrive in Hevron at least two hours before the start of Shabbat Friday night to avoid issues of lack of parking spaces and congestion. The police also appealed to the public to act in accordance with the law and the regulations, to exercise extreme caution due of the large number of pedestrians, to obey the instructions of the policemen, and to watch small children. The areas marked by the police and the security forces should not be crossed.